Myrtle Point is an upscale community located in the Lansbrook section of the popular East Lake area of Palm Harbor. 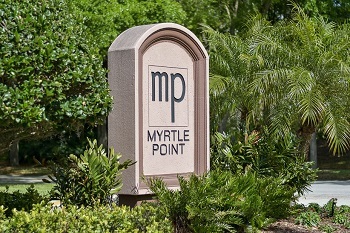 Perfectly manicured real estate properties at Myrtle Point feature stunning homes throughout this attractive waterfront community. Some Myrtle Point homes have amazing views of Lake Tarpon. The magnificent homes of Myrtle Point feature gourmet kitchens, custom cabinetry, breathtaking entrance foyers, sparkling in-ground heated pools with screened enclosures, game rooms, libraries, top of the line flooring, beautiful fireplaces, and so much more. Great for entertaining, luxury homes in Myrtle Point are sized anywhere from 3000 to over 8000 square feet of bright and wide open living space. Get lost in your home of custom built-in features galore, and step outside to boating on Lake Tarpon and golfing at Lansbrook. Close by is the YMCA, Pinellas Trail for biking, walking, and skating, county parks for picnics and recreation. Near to all major shopping, casual restaurants and fine dining, top rated schools, and just about fifteen to twenty minute drive to the most beautiful beaches of the west coast of Florida where you can take in the sunshine on the sandy shores and delight in the evening sunsets. Selling your Home in Myrtle Point? If you are thinking about selling your home in Myrtle Point- Call a Lipply Real Estate Agent today! We would love to hear from you and assist you on the journey to sell your home! Call us today and set up an appointment directly with an agent or enter your information into the form below! We look forward to hearing from you.